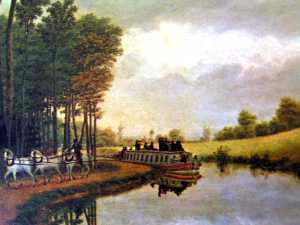 ---- -The Erie Canal was a 'pipeline' for tens of thousands of Americans moving westerly with the flow of emigration to the western lands of our country. My family was one small addition to that vast migration..
---- -My family has a long association with New York State. When cruising up the Hudson River in June 2001, we stopped at my ancestor's hometown of Saugerties. There we wrote A Family Story, the tale of the 1710 landing of the Palatines and Valentine Fiero in the New World. ---- -We continued the cruise up the Hudson to Lake Champlain, where Valentine's grandson, Christian Fiero, defended Fort Ticonderoga and Lake Champlain against the British during the early years of the Revolution. ---- -Christian's grandson, Dr. John Fiero, was married to Mary Hall. The following story, as told by Mary Hall Fiero, relates to her early years in Woodstock, New York and the family's connection to the Erie Canal. ---- -My life as a young girl growing uup and going to school in Keefe Hollow was about as ideal as life permits. The company town was small and we knew everyone involved with the glass business. Woodstock, but a short ride down the Sawkill River, was a clean bustling community primarily involved with farming and milling. --- -My sisters, Zemira and Olivia, weere not just kin but best friends. They called me the icing in the middle of the cake, since they were two years older and two years younger than I. --- -Zemira had a delightful school cllassmate, Harriet Eliza Lombard. She was a bright, laughing girl with dark hair and flashing dark eyes. She so enjoyed life and laughter that she was everyone's friend. The four of us were the very best friends. We were always together, chattering, laughing, and sharing. Father called us "a bevy of quail." Maybe so, but perhaps to others less tolerant, we were like clucking chickens. --- -I was more shy and retiring than the others, perhaps an inheritance from my New England heritage. When I first arrived in New York I was much surprised by the openness and frivolity of the other children. They shared everything - bites from their lunch apples, their toys, and the secrets of their lives. This was shocking to me. The children I had known in New Hampshire and Massachusetts were quiet and like closed books. They shared little of what they possessed, either their physical or emotional belongings. --- -There were three individuals in tthe medical community in Woodstock - Dr. Larry Gilbert Hall, an older established doctor; my father, Dr. Ebenezer Hall, and a young man, Dr. John Gillespy Fiero. Father practiced little medicine in the community since he was primarily engaged in the Woodstock Glass Works. However, he and the other doctors met on a regular basis to share new information and procedures. They often assisted each other when necessary and frequently consulted. --- -"Father's renown is only loccal, and his memory will survive only for a few generations, at most, in the love of those whom he had cured or in the least helped. But what is more important in any life than to dedicate your best to others? And is your role the less when it is your neighbors who are the recipients of your concern? He served as the model of caring goodness for me and my family, and as a source of succor and hope for all in our community." ---- -Dr. John was a thoughtful and inttelligent young man, but of greatest interest to us four "cluckers" were his handsome good looks and kind eyes. He was but four years older than Harriet and Zemira and shortly after his move to Woodstock took notice of us - perhaps it was impossible in our small community to overlook our little bevy. We met John when he came to our house to attend the weekly doctors meeting. We strategically placed ourselves on the front porch so that John would have to pass by and notice us as he left the meeting. --- -I remember the evening as though it was yesterday. It was June 1826 and the low summer light still filtered down through the fresh green leaves overhanging the porch. It was warm and humid, and the katydids were buzzing their monotonous summer drone. The birds, actively raising their young, still took out time from their busy schedules to sing their evening songs. John was a young man of but 22, Harriet and Zemira were 18, and Olivia and I were mere youngsters. --- -John left the house alone, as thee older men were deep in conversation about politics. He paused when he spied the four of us on the porch swing and asked gently if he could join us. Showing perhaps too much enthusiasm, I immediately said yes. He sat on the rail of the porch opposite us and we talked on late into the evening. He was open and friendly and immediately put us at our ease. I don't remember what we discussed, but I know that we all enjoyed the time together immensely. Although I was younger, he included me as openly as though we were all long friends. My father eventually joined us and then suggested that perhaps it was time to retire. I returned to the house and Father and John accompanied Harriet to her house. --- -Within the week, John had called at the Lombard house to meet with Harriet and her parents. She was a'twitter with the news of his calling. It was a wonderful time for Harriet and us. She would share much of their discussions with us and I felt a part of my good friend's ever closer association with the young Doctor. John obviously favored Harriet, and the rest of us were happy for her. But he also clearly enjoyed us all and we shared so many wonderful times together. On many occasions, we would be a "fivesome" to dances or evening meetings. John was a good friend for all of us, but he and Harriet were obviously in love. The rest of us were complimented to be included in their shared joy. 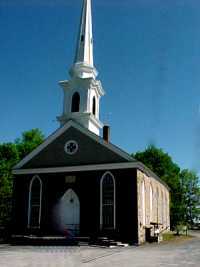 --- - In June 1828, two years after thhat fateful meeting on the front porch, I attended the beautiful wedding of John and Harriet at the Old Dutch Church in Kingston. --- -It was a gala affair and they made a most beautiful couple. They lived in a small house in Woodstock and I often visited them. --- -Great sadness entered their livess that fall of 1828 when John's father died. They had been close friends and medical partners. I spent many hours at John and Harriet's house talking and consoling my friends. We had long discussions on death and the meaning of our lives. John, as a doctor, has more frequent contact with the loss of a loved one and the consoling of the family than either Harriet or I. His comments were comforting. He believed that we are here on this Earth for only a short time and it is our duty to do as much kindness and caring for others as we can during this short duration. He entered his father's medical profession because of this belief. He believed that the good we do is our eternity - it is that which lives on forever, as it is passed from one person to another. We have all been the recipients of the caring and loving of our parents, family, and friends. Indeed, even total strangers give us a smile or a helping hand and our lives are enriched. --- -He felt the loss of his father deeeply. They were very good friends and his father was one of the kindest men I have ever met. We are all the less without him, but John believed our best way to celebrate his life is to try to live as his father lived - openly, joyfully, and with a smile for everyone. Surely John had always exemplified this to me, as well. I was so pleased that my good friend Harriet had such a good and loving husband. I remember, poignantly, my wish that I could find such a man. --- -Another point of sadness for the two of them, was their inability to have children. They had wonderful, joy-filled years but they both so longed for the sound of children's voices. Harriet and I talked long about the need, especially for a woman, to feel fulfilled with her family. --- - My younger sister, Olivia, fell in love with a glassmaker in our community. Isaac Grovier was 15 years older than she and I was uncertain about the relationship, but they were marvelously in love. He seemed a most serious young man and Olivia could be so frivolous. They, however, made a nice matched set of opposites and delightfully complimented and enjoyed each other. Isaac had a partial interest in the glass factory and thus shared many of the interests of Father. He was a welcome addition to our family. --- -They were married in 1832 - two oof our "clucking hens" had flown the coop and only Zemira and I were left. The four of us were still close friends and now our circle had enlarged to include John as well. Isaac deigned not to be included in our pack of five. --- -In June of 1833 John delivered a baby girl of my sister Olivia. We were all thrilled with the newly arrived little package. She was promptly named Zemira in honor of our older sister. She was much cuddled and adored by us all. And then, tragedy struck. --- -In June 1834, when Harriet was buut 26 years old, she became deeply ill with fever. John was frantic. In the dual role of loving husband and caring doctor he tried everything known to science. Father and old Dr. Larry Hall suggested potions and remedies. All of us old friends spent hours with Harriet. I was with John and Harriet when she died. We were devastated. We had lost a special loving friend and for John, a marvelous wife. On another warm, humid June evening, when the katydids were droning, we laid her to rest in the Woodstock Cemetery. I stood near to John and we both silently shed tears of farewell. --- -In the following months, wheneverr John was making a house call in the Upper Sawkill, he always came by Father's house to confer with Father, or in his absence, to visit with me. Our bond was initially our shared friendship and grief over Harriet. Soon his visits were not for medical consultation or our consolation but for John and I to share lively discussions. We found that we had many similar ideas and thoughts about politics, life, and values of our society. We were, I suppose, both somewhat rebellious from the current notions of our culture. For instance, I, as a woman, was not supposed to have political opinions. But I found politics deeply interesting and an important aspect of our lives. John often said he found our discussions of far greater interest and depth than any he had ever had with another man, let alone a woman. Soon we discovered a deep respect and interest in each other which matured into a fondness and evolved into a deep and abiding love. In my youth, I had hoped to find a man like John, and now I was in love with John himself. We were both enveloped in our endearing love of each other. --- -One month to the day after my tweenty-fifth birthday, John and I were married in the Woodstock Church. It was but ten months since the departure of our dear friend, Harriet. We were both certain that Harriet approved of our marriage and accompanied us in the church on our wedding day, just as I had when she married John. We were supremely happy and content. --- -One month after John and I were mmarried, my family moved west. Of the four of us young women who made such a fuss together in the Upper Sawkill, only Harriet and I remained in New York, and she, good friend, lay beneath the towering maples in the town cemetery. 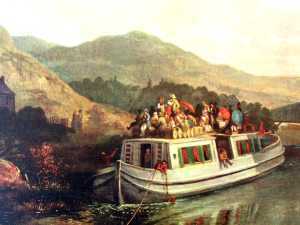 The departure of my family was a sad day for me - it is etched into my consciousness forever - 12 May 1835. --- -Economic conditions were difficullt throughout the country in the mid-thirties. Father had lived once before through the failure of his glasshouse, in Massachusetts, during a period of financial unrest. Perhaps he could see the writing on the wall again. I heard from Olivia that Michigan Gov. Lewis Cass had requested Father to come to his state. Olivia and I speculated and decided this helped trigger his decision to move. --- -John and I stood on the river bannk of the Hudson at Glasco to see off my family. Father was not a young man at age 52, but he stood, as he always did, tall, straight and confident. His face, accented by his white pointed beard, looked chiseled out of the New Hampshire granite that was his past. Mother, but a year younger, was surrounded, as she always was, with children. Little John was but 9 and Eliza 13. The "bottom layer" of our much cherished childhood cake, Olivia, shed tears as she hugged me. She turned and marched bravely, with her husband beside her and her young daughter in her arms, to the loading ramp. The "top layer," my dear sister Zemira, held me by the hands for long moments, tears streaming down our faces. We didn't know then if we would ever see each other again. The whistle sounded three long blasts, the ramp was shifted aboard, lines were cast off, and slowly the vessel slid off the shore and into the current of the river. John and I stood waving long at the departing ship - we could see Mother's white handkerchief fluttering from the aft rail until the ship slipped behind the far point and they were gone. John and I rode home slowly in the wagon and it was a quiet evening in our house that night. --- -Nine months after our wedding, allmost to the day, our first child was delivered of me by John. She was a beautiful baby girl. We named her Harriet Eliza after our departed true and loving friend. My father had delivered me and my brothers and sisters. So, for my family, did my husband deliver our babies. With gentle hands, he attended to my needs as well. --- -My family in Michigan founded a gglass works, with my brother and brother-in-law in partnership. They were proud of the first advertising for Mount Clemens glass in the Detroit Daily Advertiser on October 11, 1836. He posted me the advertisement which mistakenly spelled my brother-in-law's name: HALL AND GROVER MANUFACTURE GLASS AT MT. CLEMENS. In that same letter, he informed us that the waters of the Great Lakes were open to navigation for seven months that year and an average of six boats a day docked in Detroit, bringing some 200,000 people to the port. Michigan territory was exploding in population, which portended well for the glass business. Unfortunately, territorial roads were slow to develop, so transportation was still slow except by water. --- -In but ten months after the birthh of our firstborn, my husband John Gillespy Fiero delivered of me John Gillespy Fiero, Jr. He proudly bore the name of my dear husband. --- -The year 1837 began auspiciously for my parents and family. Michigan was admitted to the Union as the 26th state on Jan. 26, 1837. And that was the high point of the entire year -- everything went down from then. --- -The year 1837 was one of terriblee economic times. This was the apparent result of Pres. Andrew Jackson, in 1833, transferring government funds from the Bank of the United States to state banks, whence inflated land values led to rampant land speculation. "Wildcat" banking schemes followed. Economic depression began in the United States following the failure in March 1837 of the New Orleans cotton brokerage Herman Briggs & Co. When New York banks suspended payments on May 10, financial panic ensued and led to the Panic of 1837. --- -Our banking industry collapsed. AAt least 800 banks suspended payment in coin and bank notes and 618 banks failed before the year was out (many had deceived bank inspectors as to the amount of gold backing their bank notes). Specie disappeared from circulation. Employers were forced to pay workers in paper "shinplasters" of dubious value and these were easily and often counterfeited. The Panic slipped into depression. Before the year was over, 39,000 Americans went bankrupt, $741 million was lost, and the depression reduced thousands to starvation. One-third of all New Yorkers who subsisted by manual labor were unemployed in the financial crisis and at least 10,000 were made dependent on almshouses, which were unable to prevent many from starving to death. --- -The depression forced every New EEngland textile mill but one to close down. Congress, on October 12, authorized the issue of U.S. Treasury notes not to exceed $10 million. This was a move to ease the nation's financial crisis. The one positive note was that the shake out of land speculators in the economic depression made more U.S. farmland available for real farmers. --- -In the summer of 1837, before thee hardest of times hit, Father built the second brick house in Mt. Clemens, on East Broadway and East streets. It was across the street from the Glass works. The timing couldn't have been worse. --- -Father, like almost all businessmmen, was severely affected by the Depression. Father was Vice-president of the ill-fated Clinton-Kalamazoo Canal venture, which failed in the Panic of 1837. Money became very "tight" for Father. He even lost $10,000 of his own money at this time in a "wildcat banking venture." --- -However, the Michigan Glass Manuffactory of Mt. Clemens continued to operate with Father acting only when called upon to solve problems and then in a "superintendent's" capacity. Window glass was always the main item made in the factory. Some glass canes, dye bottles, and novelty items were made in the evenings by the eight remaining workers. --- -New York, and our town of Woodstoock, was not spared the hardships of the Depression. Father's former business, The Woodstock Glass Company, went out of business, a casualty of those difficult economic conditions. The Bristol glass works struggled on until 1845. --- -To brighten up the late part of tthe year, John delivered me of another son. We named him Wright Ebenezer, in honor of my dear Father, Ebenezer Wright Hall. He was born on the 24th of November, 1837, but one year after the birth of his brother John. --- -In another fifteen months, on thee 4th of February 1839, we had another baby girl whom we named for my older sister and good friend, Zemira Hall. Seventeen months later, we had another baby boy in the family, Christopher - named for John's younger brother, Christopher. Sadly, little Chris was a sickly child. Much tended by his older siblings and his loving parents, he departed us on a cold, snowy, dreary and immensely sad day in mid-January 1841 - he was not yet six months old. John and I resumed those long discussions about death and loss. How can one explain the passing of a sweet child, or a dear loving friend and wife? What is the reason? Why are some chosen to be taken and others who continue? We believe that those decisions are not for us to know. We are so sad that our little Chris was denied a full, long and happy life. In death, he was so small - so pure and innocent. He was a guiltless lovely little boy and we suffered so during his too short stay with us. --- -Within a few weeks of the death oof our dear Chris, John determined that I was once again pregnant. Our house was filled with the sounds of little children and love. We had children everywhere, running and playing throughout the house - bouncing on their father's knee in the long spring twilights of 1841. Our little Zemira was starting to totter around the house chasing after the older children. John and I were deliciously and deliriously content with a deeply fulfilled love. Never had I met a man who could be so strong of spirit and so gentle of nature. Life was good, and a new life grew within me. --- -And then, just as the long warm ddays of summer 1841 were returning to our valley in the mountains, and the katydids were again buzzing their monotonous drone from the trees, my dearest John fell ill. Within a few short days he was gone. --- -My best friends were all gone, myy family was gone, and now John was gone. I requested that John be buried in the Woodstock Cemetery beside my dear friend, and his first wife, Harriet. Why? Why? Why? All the many talks I had with John about death - the loss of his father, our dear friend Harriet and of our infant son, Chris - nothing could prepare me or console me in the death of my husband. I was so utterly alone. --- -John's younger brother and closesst male friend, Christopher, was a great comfort for me. He and I were co-administrators of my husband's estate. He and his wife Margaret lived comfortable on a farm in Saugerties. They put my mind at ease by assuming a guardianship for my eldest, Harriet Elizabeth, then five, posting a considerable bond to satisfy the court. --- -They had a large rambling farmhouuse and they insisted that my family and I should move in with them during those last difficult months of my pregnancy. Christopher's sage advice and maturity beyond his years reassured me about my financial status, which was limited. Margaret, but three years my younger, became a good and close friend for me during that time of such hardship. Without them I don't know what I would have done. Surely, God had granted them the gift of kindness and friendship and they were my saviors during my grieving and long nights of worry. --- -In those beautiful days of late OOctober, when the leaves are golden and crimson and the nights crisp and clear, our youngest dear child was born. I named her Margaret, after my companion and sister-in-law. Her middle name is Olivia, to commemorate my dear younger sister. --- -Margaret and Christopher Fiero weere most kind and good friends for me and my family. However, except for them and the many other Fiero relatives, I had no ties to the New York area any longer. My feeling of loss was overpowering, and I needed a new place for me and my young family. My financial future was uncertain and I did not want to be dependent on my in-laws. --- -My family urged me to join them iin Michigan. 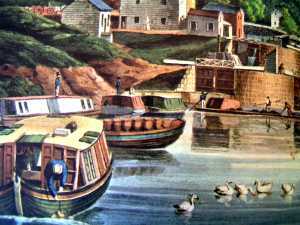 In the early summer of 1842, my family and I were gathered at the same dock at Glasco where my parents and my siblings had gathered seven years before. So much - so very much - had happened in those seven years. Then I was a newly married young woman, absorbed in the love of my dear husband, and saddened by the move of my family. Now, such a short time later, I was a widow. I had also buried an infant child. I was old beyond my years. But, I was also surrounded by a bustling, tumultuous, excited family of 5 young children. The future for me, as for my parents, lay in The West. 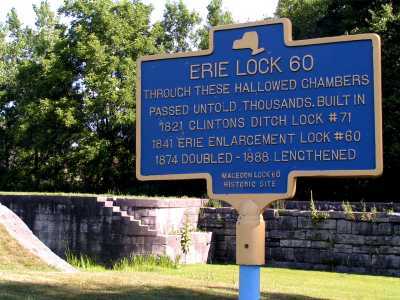 --- -The Erie Canal had been completedd 27 years earlier. Gov. DeWitt Clinton had great foresight, insisting that the canal would create a vital economic artery for New York State, linking the industrial towns of the east with the vast interior of our country. Transportation over the Appalachian Mountains was difficult from Georgia to New York and the canal proved to be the main avenue of commerce to the west. Tens of thousands had felt the pull of a new world, a new beginning, that lay just beyond the mountains and the canal gave the ready means to travel westward. --- -The river steamship pulled into tthe dock. Christopher helped to bring aboard our suitcases to our cabin and Margaret helped me manage the children -they were 6, 5, 4, 3 and less than one in age. Indeed they were a handful, but they are good and mindful children. Shortly we were organized and all on the aft rail waving to Chris and Margaret as we slowly pulled away from the dock. The children were enthralled with the river cruise, their first. 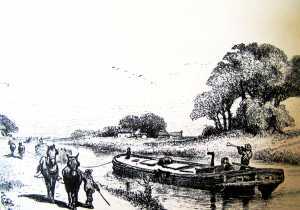 The next morning, we docked in Albany and were soon transferred by coach to the Canal Packet in Troy, across the river and the eastern terminus of the Erie Canal. How the children loved the Packet. --- -The boat was about 70 feet long, and except for the kitchen and bar, it was one long, open cabin in the interior. When I first entered the packet, and observing her many passengers, I was quite at a loss to know how berths should accommodate all the men aboard, as I saw no convenience for anything of the kind. But the boatmen, ever alert to contrivances, had settees set the length of the cabin that folded out to form a cot-bed. The space between this cot and the ceiling was rigged to hold two additional bunks. They were maintained in their position by fitting their frames, complete with sacking bottoms, into holes designed in the hull for their fitting. Hooks in the ceiling held sturdy ropes affixed to the other corners of the frames and the whole was suspended with just enough room for a man and his bedding to stack atop each other. The other passengers were filled with much apprehension, that first night, lest the cords not be strong enough to support their human burden. --- -Their fears were ggroundless, fortunately for all. The forward part of the cavernous interior cabin was the "ladies cabin," and since I was the only lady aboard it served as the domicile for my children and me. A curtain separated us from the open interior, insuring privacy for the eye, but certainly not for the ear. Boisterous men in the evening often kept my young children and I awake long into the evening, and there was no shielding their ears by that thin curtain from the profanities general among the common workingmen of our time. --- -At meal times, thee curtain was removed and the whole interior of the packet was set to one long table. The table was set with everything necessary for life, including some items that well might have been considered a luxury on such a voyage. The food was abundant and full of good tastes. --- -From the hitching of the mule in the early morning until the tying off beside a lock in the evening, the children were endlessly amused. The bridges on the canal are very low, particularly the old ones. In some cases, the baggage stowed atop the Packet actually rubbed against the lowest of the bridges. Every bridge makes us bend double, much to the delight of the older children - and in some cases we had to lie on our backs. The man on the helm shouts through his horn to the passengers, "Bridge!" or "Very Low Bridge!" or once to our delight, "The Lowest Bridge!" A serious accident would surely occur for want of caution. A young English woman met with her death a short time before our passage, she having fallen asleep with her head upon a box and had her head crushed to pieces by the bridge timbers. --- - But, being young and eternally buoyant, my children soon took to imitating the cry of the helmsmen and continued playing the game long after the termination of the voyage. One man took great delight at the approach of one low bridge in exclaiming, "All Jackson men bow down." After his comment, we find very few Aristocrats. --- -At the many locks,, we would all be out and playing on the lawns and in the woods surrounding the lockkeeper's cottage. The voyage soon took on the allure of a great vacation and we all enjoyed the trip to Buffalo immensely. --- -There we transferred to a lake steamer. Now seasoned travelers, the children were easy to manage and they enjoyed the whole process. The journey commenced at dawn and we were soon bound westerly across the vast lake. For me and my children, it was like an ocean voyage. The shores were so distant and for a short while the water so rough we felt like we were on a passage to Europe. --- -Our steamer first tied to the dock in Detroit. Such a large city! We stood on the railing and were most impressed by the hustle and bustle of the city. Then we chugged northerly into beautiful Lake St. Clair and landed at the dock in Mt. Clemens. Oh joy! There was my entire family at the dock to greet us. I could spy my mother's white handkerchief waving above the crowd of faces. Within moments, my children and I were surrounded by tearful, happy family. The icing had returned to the layer cake!